Kicking off the second day of America’s Claims Event (ACE) were four women who have had a profound impact on the P&C insurance industry. 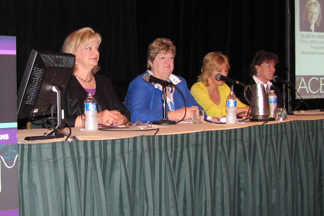 At the inaugural ACE keynote panel, “The Feminine Mystique and Insurance,” which took place on June 16th, four industry leaders took the stage to share their formulas for success and longevity in the P&C insurance industry. Claims Magazine Editor in Chief and ACE Chairperson Christina Bramlet moderated the dialogue, which covered topics such as career advancement, personal assessment, and communication skills. Below are some highlights from the discussion.